Troop 113 has been raising Eagle Scouts for over 50 years. We are a Troop of roughly 20 boys that love to do outdoor activities, mainly camping. Our meetings are held at Calvary Lutheran Church (9101 Highland Rd, White Lake, MI) Tuesday nights at 7:00PM. Monthly campout past locations: Camp Agawam, Highland Recreation Area, Pontiac Lake Recreation Area, Camp Munhacke, Frankenmuth and even Ohio's Wright Patterson Air force base. Participation in Council and Order of the Arrow sponsored events such as Rendezvous, Hike in the Boonies, Camporee and Sash-N-Bash. As a Troop we are devoted to helping out the younger boys achieve higher ranks on their trail to Eagle, even if it is a simple act of showing someone how to tie a knot or demonstrate the proper way to honor the colors. The older Scouts,through hours of work, are all trying to complete their journey and earn the Eagle rank. So far, over many years, more than 45 Scouts from Troop 113 have joined this select group of individuals, and we hope to see many more reach this level. Troop 113 is a boy-led troop. It is our goal to provide our Scouts with the tools and resources to develop the skills needed to become responsible young men. The Scouts provide the enthusiasm and make the fun. Troop 113 is run by our Senior Patrol Leader (SPL) and the Assistant Senior Patrol Leaders (ASPLs). Each Patrol has an assigned Patrol Leader. Together this group of boys makes up our Patrol Leader Council. The Scoutmaster and Assistant Scoutmasters work with the troop through the SPL and ASPLs to provide leadership and a safe environment for the boys to meet. Committee Members provide the resources to support all troop activities. They attend to the equipment, monies, communication and other responsibilities that allow the Troop to run. Scout Parents are encouraged to volunteer for various functions to help support the troop and are always welcome to join us on campouts (Youth Protection Training required). Troop communication is given verbally to the boys each week at the Troop meeting. Digital communications include our own website hosted on ScoutLander, which allows us to keep all Scouts and parents informed on current and future troop activities and keep necessary forms. Additionally,Troop 113 has a Facebook page where members of the Troop can join and share pictures, stories and memories. 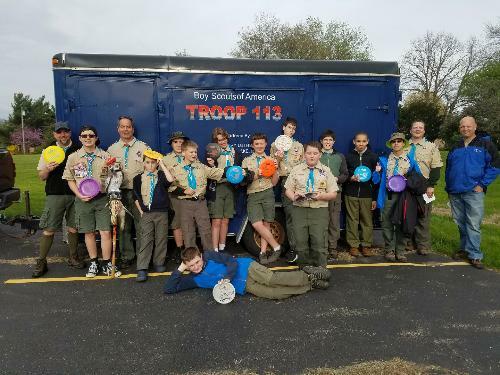 Troop 113 has a trailer which is fully equipped to supply the Scouts with the required equipment needed to have a successful camping experience. This includes tents, lanterns,cooking equipment and first aid kit.Scouts will need their own sleeping bags and mess kits. Troop 113 meets every Tuesday at Calvary Lutheran Church (White Lake) from 7:00-8:30 PM. Our schedule follows the Waterford School district schedule. Troop 113 camps out a minimum of 9 times in the year. This includes 8-weekend campouts and one week for summer camp. The Scouts plan all campouts and a theme for each campout. This is done at the monthly Patrol Leader Council Meetings (PLC). Troop 113 plans at least one High Adventure opportunity for our Scouts each year. Past events have included Isle Royale,Porcupine Mountains, Philmont Scout Ranch, Florida Sea Base, canoe trip, whitewater rafting, etc. The Order of the Arrow is Scouting’s National Honor Society, honoring Scouts that best exemplify the Scout Oath and Law.Troop 113 has a number of Scouts and Scouters elected to, and active in, the OA. It is a great privilege to be voted into this exclusive group of Scouts. Have additional questions, or would just like to contact someone from the Troop? Feel free to stop by one of our Troop meetings on Tuesday nights, or contact our ScoutMaster, John Dotson via email at troop113scouting@yahoo.com.